Donald Young celebrates in France. That whole story was a fake, by the way. It was a publicity stunt set up by agents, and it worked to build a myth. The myth worked against Young, told a lie that everyone bought into, including Young and his parents, because US tennis is so desperate for the next big thing. The thing is, when he beat Feliciano Lopez in the second round of the French Open, Young, finally became a feel good story again, guaranteed to last — until his next match, anyway. 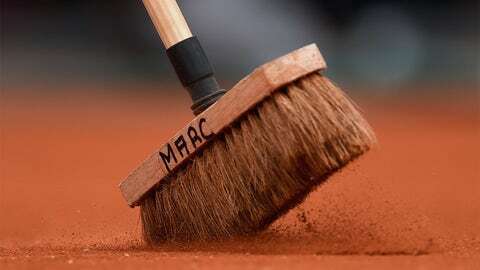 Check out the best images from the court in the early rounds at Roland Garros. And maybe the USTA, too. 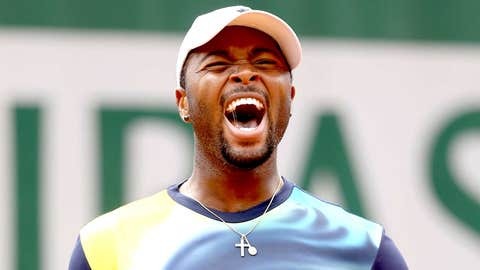 Young has told stories of how he was childhood friends with fellow Chicagoan Taylor Townsend, who had her breakthrough at this French Open. The USTA refused to fund Townsend two years ago, saying she wasn’t fit. It was a dangerous threat, using a code word to call a teenage girl fat. So two African-American kids from Chicago, two prospects who were the No. 1 junior players in the world, had major fallouts with the organization charged with developing them. That said, the USTA did help both players. And it seems to have a decent relationship with Young now. He was placed on the Davis Cup team this spring ahead of Ryan Harrison and Jack Sock. “Would I love to be further along by now? Yeah, for sure,’’ Young said at a Roland Garros news conference. “But it didn’t happen. Now, I’m starting to play better – not better, but more consistent than before. 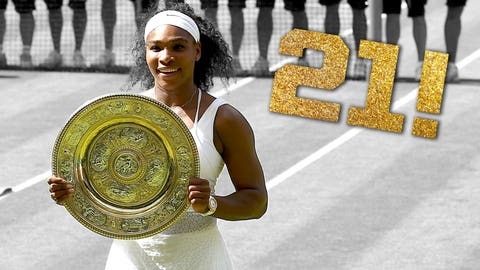 Serena Williams is in the most exclusive of tennis clubs, with 21 major titles to her name and counting. Take a look back at them all. If he beats Guillermo Garcia-Lopez — a player he beat the only time they played each other — on Saturday, then Young might become the second-highest ranked player in the US behind John Isner. (If Jack Sock wins, too, he also could stay ahead of Young). Is this another momentary blip of success for Young? It may be too close to call. Lopez might be nearly washed up. And a short while ago in Nice, Young lost in qualifying 6-1, 6-2 to a player barely ranked in the top 200. Last month, he lost to players ranked 382 and 221. But he also has wins this year over Juan Monaco, Carlos Berlocq, Jarkko Nieminen and Andreas Seppi. Who aren’t household names in the general sports world, but the tennis world knows who they are. And Young took sets off Andy Murray, Kei Nishikori and David Ferrer. That leads you to believe in his work ethic. The word about him was always that he didn’t have one. He said that when he was younger, he was doing things other kids his age couldn’t do. So he took his success for granted and didn’t work hard enough. Young’s past clouds the view. But at 24, he is actually just coming into his prime now. He seems mature now. We are about to find out how far he can go. I’ve tended to agree with Young and his family on their disputes with the USTA. Young’s parents have always been overly present. It didn’t look good at minor league events when his parents were always there, treating him like a kid. Eventually the USTA finally had enough of Young’s parents. USTA officials sent Young’s family a letter, he once told me at the US Open, telling him he had to use USTA coaches, not his parents. And if he didn’t, the USTA would cut off his funding. Young’s past clouds the view. But at 24, he is actually just coming into his prime now. The USTA said it needed to be able to have some control in decisions made about its investment. Young chose his parents. I first met Young and his parents at a South Side Chicago park when he was a kid, and agents were already trying to sign him up. Soon, he would be pumped up too much. For example: Why was I, a Chicago Sun-Times columnist at the time, watching a little kid play tennis? I believe Young’s family bought in too much because they figured, if John McEnroe thought their son was the next great thing, then surely he was. That led to friction and fights over how he was treated while a child should have been having a childhood. So it’s testimony to Young’s resilience that he is still here, having his best moment. I’d like to congratulate him on his perseverance. But he has a match Saturday.